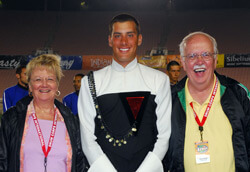 Founded in 1981, the Friends of DCI program began with a dedicated group of some 30 passionate drum corps fans who came together and decided to donate a few dollars more than the value of their tickets, with the hope of contributing to the future of Drum Corps International and its corps. Many of these charter members still enthusiastically support the drum corps activity today, as the ranks of the Friends have grown to more than 400 generous benefactors. More than 180 current Friends have been contributing annually for more than a decade. Now is your chance to become a Friend to the more than 5,000 performers who take the field each summer in the pursuit of excellence!